At 90, Bill Stern ′40, SM ′41 has been running for 46 years. And in early August, he competed in the 2009 Summer National Senior Games—and did MIT proud. Bill Stern ′40, SM ′41. 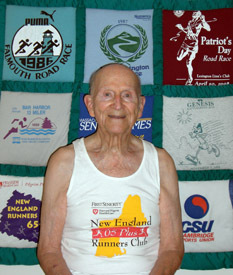 Of course, Stern was well prepared for the races—he’s a member of the venerable Cambridge Sports Union running club, he completed a Boston Marathon, and now belongs to the New England 65 Plus Runners Club. You can read about his life and his successful career in sensing, measuring, and recording equipment, including starting a company with MIT faculty, in his alumni profile. As one of the original members of the MIT Women’s Cross-Country “Club” back in 1975 (before it was an official “Team”), I am inspired by your achievements!